Mark your calendar for May 4, as dozens of venues open their doors for spring’s biggest celebration of the arts. 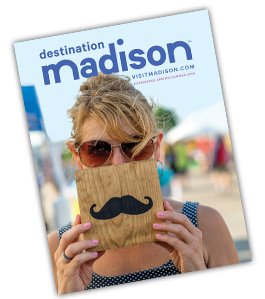 Tour Madison’s vibrant arts scene—popping up in neighbor­hoods throughout Madison from 5:00 PM to 9:00 PM. Gallery Night has been lighting up the night in Madison for 30 years, offering an opportunity to enjoy a wide variety of visual art offerings throughout the city. Galleries, artist stu­dios, non-profit organizations, and other local businesses showcase original artwork and host special exhibitions, dem­onstrations, and receptions during this semi-annual event. Be sure to share your Gallery Night photos and reviews on social media using #MADGalleryNight.